With this great offer you can get your log store all stacked up ready for Winter at last years prices, with some freebies thrown in too! Choose between our ever popular Kiln Dried Hardwood logs or if you have a wood burner then maybe pick our Kiln Dried Stove logs. 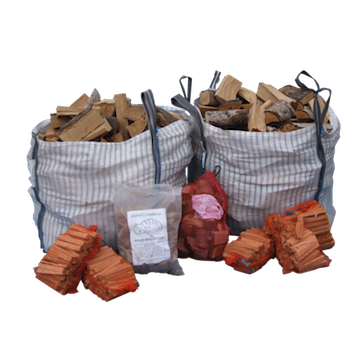 Either way you will get some free kindling to get that fire started, as well as a net of Bertie’s chimenea chunks for your fire pit, a bag of wood briquettes and a bag of our new paper briquettes. Bertie’s Summer Offer has once again been a huge success and we would like to thank everyone for their orders. If you are an existing customer and have missed out on the Summer Offer through perhaps being away on holiday or just forgetting to put the order in, then please give Peter a call on 01732-850600 to see if we can squeeze a delivery in for you this week. This offer is for existing customers only and final orders must be placed by 5pm Wednesday 5th of September. Bertie’s great Summer Offer is now on! 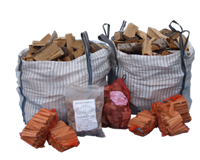 Order 2 bulk bags of kiln dried logs and receive FREE – 5 nets of kindling, a net of Chiminea Chunks, a 10 kg bag of briquettes, plus local delivery. Offer ends 31st August, so order today!